As I write this the fantastic BBC programme, Life on Mars, has only three episodes left before it concludes. For some reason I feel the need to speculate what might be to come. We know the series is coming to an end and we have been led to be believe that the basic premise of the series will be resolved, i.e. has Sam Tyler really traveled back to 1973, is he in a coma imagining the whole thing, or is he from 1973 and simply mad (with an uncanny knowledge of future events)? If there is no Sam Tyler then this new series cannot be a figment of his imagination – Sam has been in every scene of Life on Mars (though somewhat tangentially in a few scenes last week when he was seeing people’s memories) exactly to suggest it could all be in his head. They can’t change that premise now, even if Life on Mars turns out not to be his imagination, after all. From that we can probably deduce that Gene Hunt is/was a real person in Sam’s real world. We haven’t had a definite date for Ashes to Ashes but it must be at least seven years after Life on Mars. 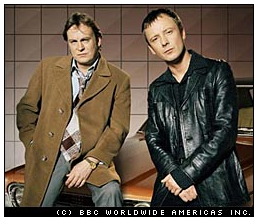 Will they age Philip Glenister for the 1980s Gene Hunt? Given all the weird occurrences that happen to Sam, the Test Card Girl, the Open University Lecturer, the newspaper headlines, signage, etc. that all signify a world outside of Sam’s 1973 I think we can discount time travel. Yes, it could be his imagination. Perhaps hallucinations are a byproduct of the time travel or his particular method of it, at least. Nonetheless I don’t quite buy it. They’ve been pushing too hard with all the coma references to explain those so out of hand. Likewise the idea that he is a native 1973 man who is simply mad is… hard to accept. Yes, perhaps he has some form of precognitive clairvoyance (or whatever the ‘proper’ term is). That will be enough to send anyone mad and perhaps his waking up next to his 1973 car was after some form of psychotic break – hence why he can’t remember his real life and is unconsciously making up the 2006 life/coma story. A nice idea but we’ve not had any other hints of the paranormal in the series, so that might leave people feeling a little short changed as an explanation. That leaves us back with the premise they’ve been pushing so blatantly from the beginning – namely that he is indeed in a coma and imagining his 1973 environment to kill his personal demons about the era and teaching himself to work by instinct sometimes rather than just mechanically by-the-book. As I said, these ideas are pushed so hard that it will take quite something to turn them on their head. Perhaps that’s the set up, we are going to be given a massive twist. Perhaps, but I doubt it. It is probably more complicated but I don’t believe the final resolution will wash away everything we’ve already thought. In a way I hope I’m wrong – so long as they do it in such a way that we don’t all feel conned. So, Sam is in a coma in 2006 imagining a 1973 world inhabited by at least one real person – Gene Hunt. The obvious answer is that Sam met Gene Hunt as a child, possibly in relation to his father’s disappearance (and we probably haven’t heard the last of that yet – could Gene Hunt be Sam’s father? Probably not!) Perhaps Sam didn’t meet Gene Hunt until the early 80s and has just projected him back into 1973 as Sam needed to be there to investigate what happened to his father? That will certainly save any grey hair dye for Glenister in Ashes to Ashes. Nonetheless, why Gene Hunt and where did these stories come from? Well, here’s my feeble explanation – what if an elderly Gene Hunt is in the bed next to Sam’s and retelling some of his old police stories to his comatose colleague? Sam is taking those stories and directly incorporating them into his dreams? As a final thought – it’s interesting that we don’t actually see Sam get hit by the car, watch that scene again and tell me there isn’t something a bit odd about it. A deliberate story element or just a production convenience? I said I’d mention more of MMOs and, well, then went quiet! Mainly that was thanks to a combination of laziness and the most recent Staggering Stories update – which was mammoth (and late thanks to the extinct hairy elephantness of it). The quality was even better than that quantity, too – look on the Staggering Stories site for yourself! A big thank you to everyone who helped make it possible – another update to be proud of! Back on topic, though. I won’t go back to the glory days of MMOs here (I may return to that in the future, though, if you are unlucky). Instead I will have a quick moan about Sony Online Entertainment! It starts with Vanguard: Saga of Heroes (well, actually it started with Star Wars Galaxies but ignoring the past…) Vanguard is a game of incredible potential. A truly massive game in scope and real estate. Real estate? Yes, it has big wide rolling landscapes with a very naturalistic look. It would be stunning to look at it if I didn’t have to drop my resolution so low to get it to run on my machine. Even at that low res I have to turn the image quality settings right down just to get 20+ Frames Per Second out in the wilds. In major cities the frame rate drops to 2 or 3 FPS – a slide show. True, I don’t have the most up-to-date hardware but I can run the likes of World of Warcraft and Guild Wars at full quality settings (and both look fantastic). I would even go as far to say that WoW looks better than a fully spiffed up Vanguard. The reason: style. Vanguard visuals try to look more natural but are doomed to be less interesting than the highly stylised look of others. That’s the difference between an art direction and trying to make something look like it would out of my window. So, besides the slightly boring looks and abysmal performance, what else is wrong with Vanguard? There are obviously the inevitable bugs that come with rushing a game out before it is ready (and Sigil, the makers of Vanguard, apparently even admitted as much – they needed the money!) Those will, hopefully, be fixed in time (unlike what happened with SWG, which still has launch bugs to this day and plenty more besides.) The game play is the thing that really kills it right now, though. They have added new ideas, particularly the Diplomacy ‘card game’. They’ve borrowed some of the best ideas from SWG, such as player housing and in-depth crafting. They haven’t, however, brought in the best element of SWG (now missing in action there too) which was forced class interaction. Players had to seek medical attention, they had to have down time with entertainers, they had to buy armour, weapons and food – looted versions were only basic and virtually worthless. That’s not there in Vanguard, instead you have vendors with computer generated items and loot drops. There are no real reasons to go back to town, that I’ve found, other than to visit trainers or quest NPCs. The quests themselves are pretty standard fare of kill N of X creature, kill Xs until you have looted Y objects or visit location/NPC Z. Nothing new there. It sounds like I’m completely down on Vanguard but I’m not. The real thing that colours my vision of this game is the performance. I’m not going to spend the best part of a £1000 to upgrade my machine to a point it might approach comfortable playing conditions. Towards the end of the year I probably will upgrade my machine, it’s due, but no other game I’m currently playing requires it right now. Vanguard is not compelling enough to force me to upgrade early. The other fly in the ointment is SOE’s price hike for their Station Access subscription. Station Access gives you a subscription to all of SOE’s MMO games for one monthly price. A good deal if you want to dabble and the price is right. What was $22.99 (Yankee Dollars, plus 17.5% VAT for us Europeans), when I originally signed up for it a little over a year ago, has now been announced will go up to $29.99 on the 2nd April 2007. What must be a little under a year ago I quit Station Access when they pushed the price up to $24.99. If an extra couple of dollars made me cancel my Station Access last time you can imagine what five dollars will do now I’ve returned to it, for $25, this time. This new price rise means that Station Access is actually more expensive than two monthly recurring SOE games (by one cent – they are $14.99 each a month). It’s even worse if you compare paying for three, six or twelve months at a time – an option you don’t have with Station Access. Three months subscription to one of their games comes in at effectively $13.99 a month, six months at $12.99 a month and twelve months at $11.99 a month. Station Access used to be a reasonable deal for playing one game and dabbling in all of SOE’s other games (you still have to buy the retail boxes and upgrades, though). Now you’d have to be seriously playing two SOE games and wanting to dabble with the others to make it worthwhile. I doubt many people have the time for that. SOE are pushing away their most dedicated supporters. They will never get anywhere close to challenging World of Warcraft’s dominance with behaviour like that. On a happier note, it looks like Babylon 5: The Lost Tales is shaping up nicely. Warning: many spoilers there, I saw a couple and stopped reading it! Nonetheless the pictures are basically safe as we all know who’s in this already!